It’s a Staples High School sports tradition. Before post-season tournaments, some boys teams shave their heads. Others get Mohawks. This year, the volleyball guys decided that instead of looking fierce (or stupid), they’d look good. Yesterday, they headed to Effi’s Salon in Saugatuck. There, owner Effie Andriotis colored the Wreckers. The 2018 Staples High School volleyball team — and Effie. But make no mistake: This team is tough. The volleyballers finished their regular season last week with a perfect 19-0 record. Even more incredible: They won 57 sets this spring, and lost just 2. Tomorrow (Wednesday, May 23), the top-seeded Westporters take on Trumbull in the FCIAC semifinals. Game time is 5 p.m., at Fairfield Ludlowe High School. They’d love a huge crowd to cheer them on. They wouldn’t mind some props for their hair, too. 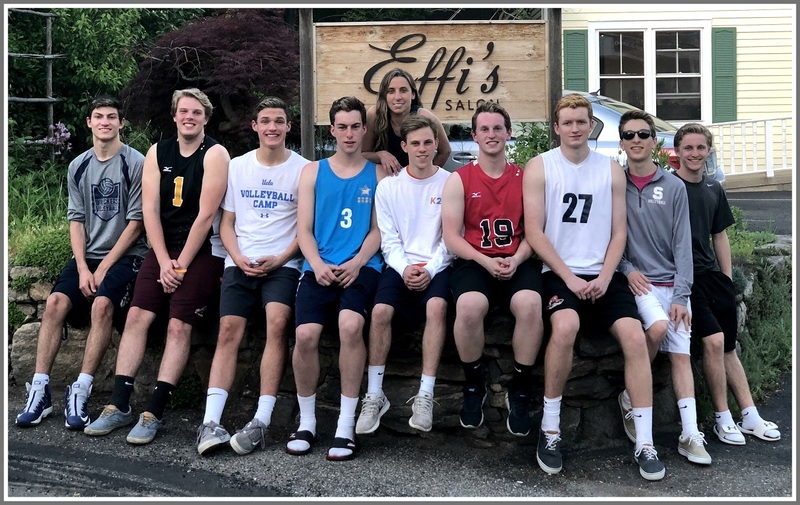 This entry was posted in Local business, Sports, Staples HS, Teenagers and tagged Effi's Salon, Effie Andriotis, Staples High School boys volleyball team. Bookmark the permalink. Congrats to the team and to Effie! They won! And went on to beat archrival Ridgefield in 3 sets on Friday for the County Championship. We are certain it is the tips that are making their dream season a reality. Stay tuned for the State playoffs 5/30; 6/1; 6/5 and 6/7.